This entry was posted in Calls for Paper/Proposal and tagged conference, Education, medicine, nursing, Psychology, Research. How to volunteer for garden volunteer sessions: we work in the garden rain or shine, so come dressed for the weather. We have extra rain boots, gardening tools, and gloves to share. Bring a snack and water bottle – bring friends and family (of any age) too! No experience necessary. 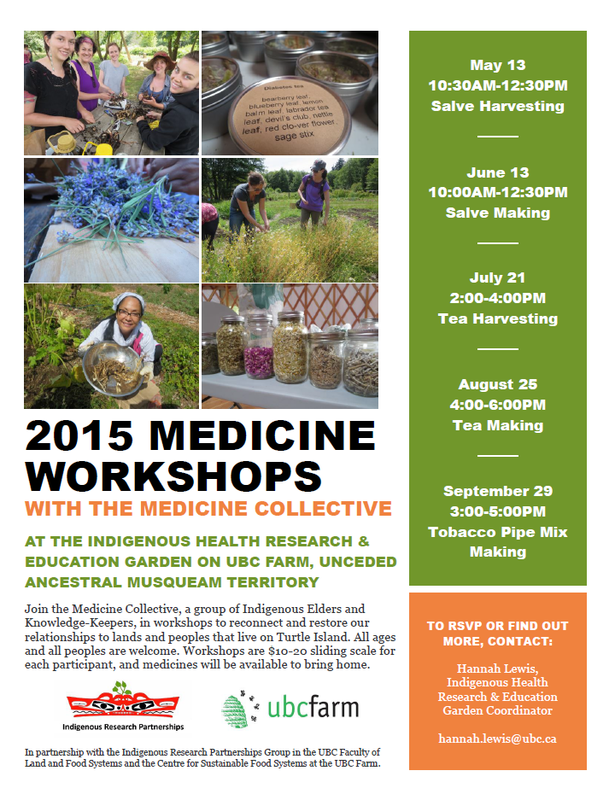 You will find us in the Indigenous Health Garden at the UBC Farm. The most up-to-date directions to the UBC Farm can be found here. Once at the Farm, you can follow the “Aboriginal Health Gardens” signs to find our garden here. How to volunteer for the Feast Bowl: join us at the UBC First Nations Longhouse (1985 West Mall) at or after 9:30AM to help us harvest or cook, or 12:30PM to eat lunch with us. Extra help from any age or skill level is always appreciated, especially in the kitchen. If you can only join us for lunch, we encourage you to come anyway and we look forward to sharing a delicious meal with you! This entry was posted in Course, Events and tagged Aboriginal and Indigenous, Education, health, medicine, volunteer, workshop. RSVP or learn more, contact Hannah.lewis@ubc.ca. This entry was posted in Events and tagged Indigenous Knowledge, Land, medicine, Spirituality.